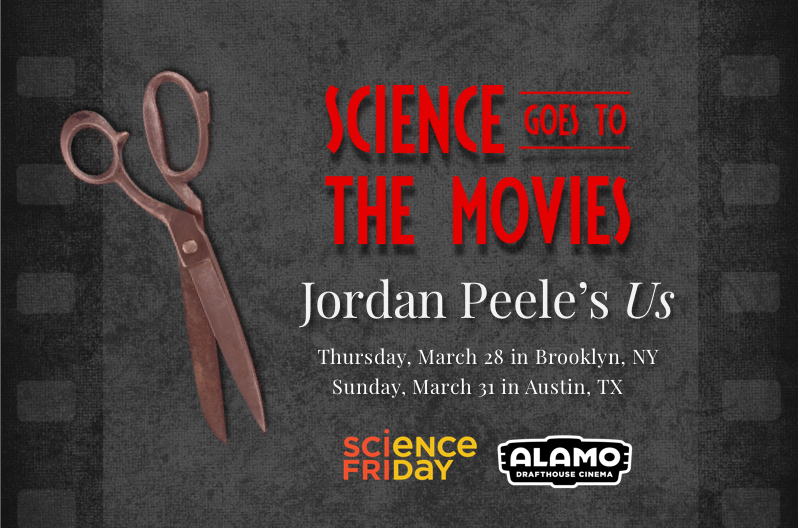 On March 28 – 31, Science Friday is bringing ‘Science Goes To The Movies’ to select Alamo Drafthouses to reveal the science behind upcoming blockbusters. Each event will feature a screening of Us, followed by live conversations with local scientists ready to talk about the science behind the film. Check out your local listing for tickets and info! Brooklyn, NY – Thursday, March 28 at 7:30 p.m.
Tickets: Tickets are $17.50 and can be purchased here. Austin, TX – Sunday, March 31 at 1:45 p.m.
Tickets: Tickets are $9.50 and can be purchased here. In Brooklyn, we’ll be joined by clinical psychologists Monnica T. Williams, whose research focuses on African American mental health, culture, and psychopathology, and Sarah Frankel, who specializes in the treatment of children and adolescents who have experienced traumatic events. We’ll also speak with poet, journalist, and literature professor Nicholas Powers. At the Austin screening, we’ll be joined by Dr. Robin R. Means Coleman, author of Horror Noire: Blacks in American Horror Films from the 1890s to Present. We’ll also talk with psychologist and neuroscientist Alison R. Preston, Ph.D., who studies “how we become wise” with a focus on the neurobiological systems that help us remember the events of our lives, and psychologist Marlone Henderson, Ph.D., whose research has explored social conflict, social judgments, prosocial behavior, and the role that basic cognitive processes play in promoting social harmony. Don’t see your city? Don’t worry, we have lots of fun events coming up this year all over the country. Sign up for our events newsletter to find out when we’ll be coming to you!